Last November, the National Complete Streets Coalition adopted a new and improved policy framework for grading Complete Streets policies. Our revamped Elements of a Complete Streets Policy raises the bar by calling for stronger commitments to equity and implementation. To celebrate the new framework, this year we’re highlight some of the best Complete Streets initiatives, projects, and champions around the country in lieu of our usual annual Best Complete Streets Policies report. Between now and the release of the full report on March 21, we’ll be profiling one winning initiative each week. First up: Rochester, New York’s Inner Loop East Transformation Project. Inner Loop East Transformation Project site plan. Photo courtesy of City of Rochester and Stantec. Through the Inner Loop East Transformation Project, the City of Rochester, NY is reimagining its street network by putting people and place before cars. Thanks to a federal TIGER grant and broad support from the community, Rochester is converting an outdated urban expressway into a walkable, bikeable Complete Streets boulevard. The project reconnects the neighborhoods once divided by the expressway and works toward achieving the goals set forth in the city’s Complete Streets ordinance and Master Plan. Rochester has implemented three of the key implementation steps for Complete Streets initiatives. The Inner Loop East Transformation Project is the culmination of a broader Complete Streets initiative in Rochester, NY. The city formally established its commitment to Complete Streets in 2011 by adopting a Complete Streets ordinance. The ordinance pledged to “create an interconnected network of transportation facilities which accommodate all modes of travel”. 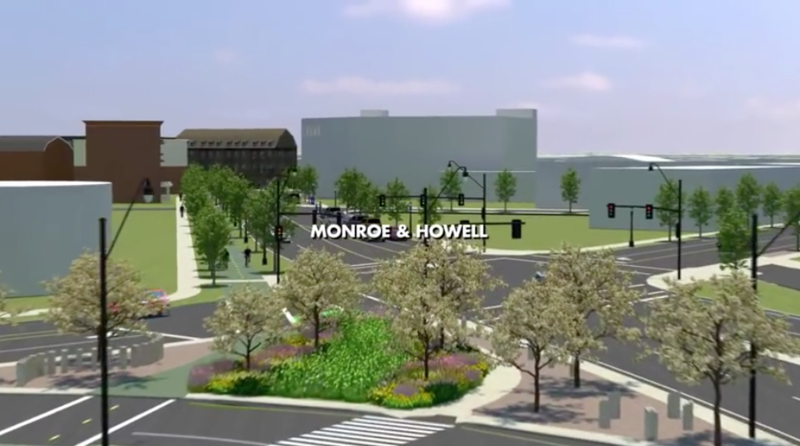 Three years later, the city revised its Center City Master Plan to support this commitment to Complete Streets, re-envisioning downtown Rochester as “an urban community of lively streets and public spaces that provided a desirable place to live and work”. By taking these steps, the city has made it easier to implement Complete Streets improvements on the ground and identify which corridors need to change to realize this vision. 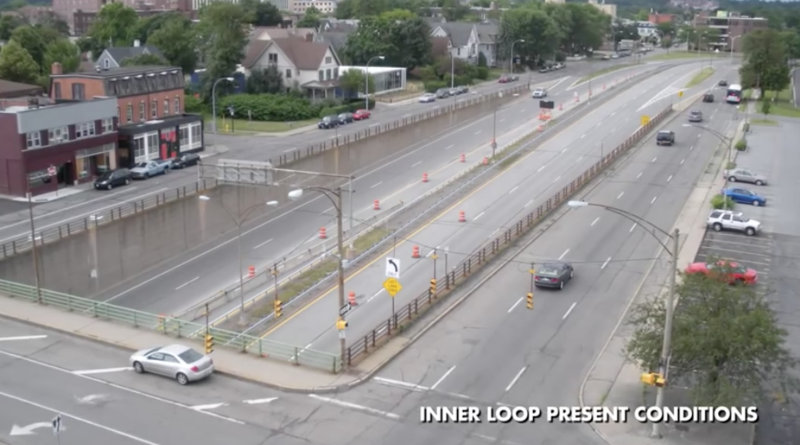 Rochester recognized that the Inner Loop, a major car-oriented bypass dug into the ground, was inconsistent with the city’s new vision and decided it was time for a change. Photos courtesy of City of Rochester. Like many cities around the country, Rochester experienced rapid, sprawling growth in the aftermath of World War II. Suburbanization created new travel patterns with an increasing number of commuters driving into and out of the downtown core. In an effort to mitigate congestion, the city carved a series of trenches through its downtown. This ring of sunken bypasses formed the Inner Loop, a project that was hailed as innovative at the time. 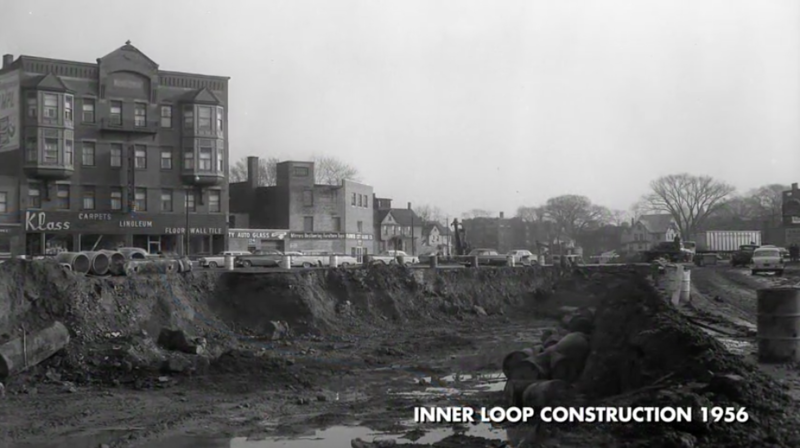 Unfortunately, like most urban highway systems, the Inner Loop ultimately stifled downtown development, disconnected neighborhoods, and made it more difficult for people to walk, bike, and ride public transit into downtown. Photo courtesy of City of Rochester. 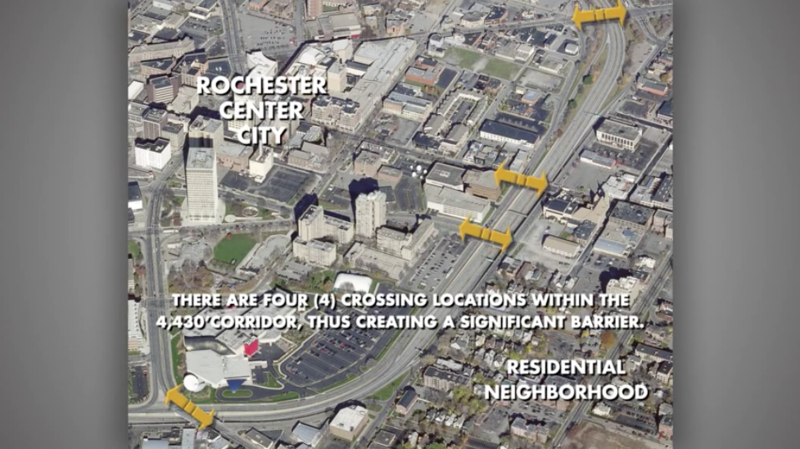 To create better street connectivity downtown and create new opportunities for development and active transportation, Rochester is filling in a 4,500-foot stretch of the Inner Loop to create a new Complete Streets boulevard at street level. Thanks to broad support from a range of stakeholders, including neighborhood groups, business associations, and real estate developers, Rochester successfully applied for a federal TIGER grant to help fund the transformation. The TIGER grant covers 80 percent of the cost of the $21 million project, supplemented by smaller matching contributions from the state and city governments. Construction began in November 2014 and ended in December 2017. In addition to filling in a portion of the six-lane sunken expressway, the project also converts the existing surface-level streets that run alongside the Inner Loop into green space and land for redevelopment. In all, the city is eliminating 12 lanes of roadway designed exclusively for high-speed traffic, freeing up 5.7 acres of land for mixed-use development along a new, walkable boulevard. The redesigned corridor includes landscaping, protected cycle tracks, wide sidewalks, and frequent crosswalks. This design also reconnects nearby residential neighborhoods to the East End, a vibrant downtown district, by restoring the portions of the street grid formerly blocked off by the Inner Loop. As a result of this transformation, Rochester expects to see many important benefits including improved traffic safety, increased public and private investment, job creation, and reduced maintenance costs. The project will also support healthy living and sustainability by providing connected infrastructure to support walking and biking. Retrofitting outdated, car-oriented infrastructure is a common challenge to Complete Streets implementation, particularly in places that experienced rapid suburbanization after World War II. Towns and cities around the country can learn from Rochester’s example to reshape their own urban expressways as people-oriented Complete Streets. This innovative project demonstrates that with broad community support and a bold vision for change, it is possible to reimagine major car-centric highways as vibrant public spaces with broad benefits for health, safety, mobility, connectivity, and economic vitality.